The series' main protagonist, Ryuuji is a seventeen-year-old high school student in his second year, class 2-C. Due to biological inheritance, his sanpaku eyes make him look like an intimidating delinquent and causes many misunderstandings. He lives in a fatherless family with just his mother, and due to this, Ryuuji has learned to be self-sufficient. He is good at cooking and keeps everything in his house clean (to the point of obsession), and also excels at sewing. He holds a crush on Minori Kushieda, a girl in his class. He has a pet, parakeet named "Inko-chan" ("inko" literally means "parakeet" in Japanese). Ryuuji often helps Taiga with domestic chores which she is unable to perform. 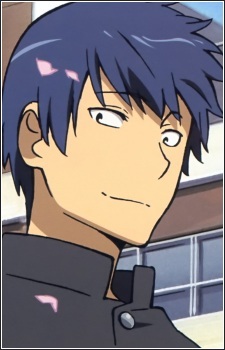 At school, he is known as "the only person able to stop the palmtop tiger," referring to Taiga's nickname. Due to the misunderstandings of his look, he tends to look down on himself and lacks self-confidence. Despite this, he is rather calm in most situations. He is responsible, smart and has great grades, even when compared to Yuusaku Kitamura, his best friend. He is dense when it comes to girls' feelings, especially about things between him, Taiga, Minori and Ami. His feelings and relationship to Taiga begin to change as he spends more time with her throughout the series.